Only 3 More Bike to Work Days Left! In light of tragic events across the country, RTA and Transit Police are continuing their commitment to the safety of customers, passengers, and employees. Building on the Department of Homeland Security's "See something, Say Something" campaign, RTA has been working with Cincinnati Bell Technology Services to offer a safe and discreet way to notify Transit Police Dispatchers of suspicious or criminal activities via text message. The 575-EYES "See Something, Text Something" campaign is designed to allow customers to send SMS text, photo, and video messages to Transit Police. There are no apps to download. Users simply send text messages to 216-575-EYES (3937), and dispatchers are notified of a LiveChat session. They can then talk with the customer via text and, if needed, push the message to responding field officers who can monitor the chat with the customer. We all have a responsibility to report suspicious activity to keep our fellow riders and ourselves safe. And riders certainly enjoy having her as their Trolley operator. Some people will even wait specifically for her Trolley so they can catch up on life and other goings-on. 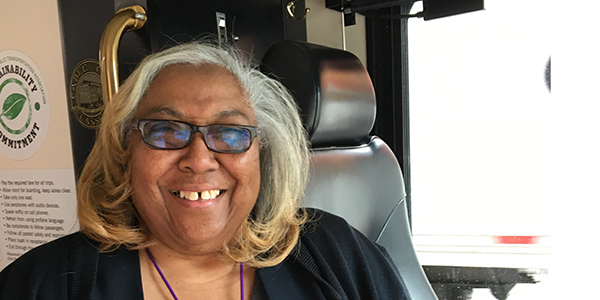 The feeling is mutual: Eddie Mae loves the familiarity she has with her returning customers, and remembers their riding habits and regular stops. Of course Eddie Mae is a Trolley Ambassador, but she might also be considered an ambassador for our great city. She loves speaking with tourists to find out what brings them to Cleveland, and she’s been known to point out the best events and destinations around town—and her knowledge goes far beyond the obvious choice of bringing people to the Rock and Roll Hall of Fame. Between her above-and-beyond customer service and her infectious smile, she is truly a distinguished employee who makes RTA great. As we strive to provide the best service to all of our riders, we need to perform maintenance and repairs to our infrastructure. For three weeks, July 22 – August 11, Red Line riders will be inconvenienced due to a major track replacement project on the west side. 66R buses will replace Red Line trains between Puritas and West 117th stations in order to reconstruct the tracks in the area between West 117th and West Park. This means that some customers will need to board a train, then a bus, then a train in order to reach downtown Cleveland. A temporary Red Line timetable, with train and replacement bus times, will be printed and posted on the web. While 66R buses will operate at a frequency that mirrors the train schedule, please plan an additional 30 minutes to your commute during this time. Enjoy this free community concert featuring the talents of the world-renowned Cleveland Orchestra. It’ll take place rain or shine on Friday, July 6. Pre-concert activities (including food trucks) begin at 6 p.m. The orchestra will perform at 9 p.m., followed by a spectacular fireworks display. Gather on the spacious Mall B (located at 300 St. Clair Avenue, Cleveland, between the Global Center for Health Innovation and Cleveland Public Auditorium) and prepare for a night to remember. Mall B is a short walk from RTA’s Tower City station, so ride any Rapid line for hassle-free transportation. Don’t let a lack of parking spaces spoil your fun. Take the Red Line rail to the Little Italy - University Circle stop. University Circle is just a short walk from the station. Flat Out Fridays is a free summer concert series, and the next performance will be at 7 p.m. on July 13 with a performance by the band Faction. Avoid the hassle (and expense!) of parking, and go RTA. The Flats East Bank is served by the C-Line Trolley. The service operates 7 p.m. – 11 p.m. Monday – Friday, and 11 a.m. – 11 p.m. Saturday and Sunday, with Trolleys running every 10 minutes. It’s free with a smile! Beyoncé and Jay-Z's co-headlining On the Run II tour is coming to Cleveland on Wednesday, July 25. The couple's blockbuster performance starts at 7:30 p.m. at FirstEnergy Stadium. The concert is sure to draw a large crowd—and equally huge traffic snarls and parking prices. Make "Lemonade" out of lemons and ride RTA. Take any Rapid line to Tower City, and then take the Waterfront Line to the West 3rd Street Station. The stadium is just across the street. The award-winning phenomenon “Hamilton” will be coming to Cleveland for a month-long residency starting Tuesday, July 17. Due to the popularity of this show, parking lots will fill up quick. But don’t throw away your shot at a convenient transportation option! Take the HealthLine to E. 14th Street stop or use the C-Line or E-Line Trolley, both of which serve Playhouse Square. RTA is hosting our Quarterly Service Planning Open House on Tuesday, July 17 in the RTA Main Office Board Room located at 1240 W. 6th Street. There will be two sessions, 12 p.m. and 5:30 p.m.
We welcome feedback and comments on all aspects of our service at these gatherings. For the July 17 session, we would appreciate special attention paid to the 14, 15, 19, 76, 77F, and 90F bus routes. We hope you’ll join us if you’re able, as meeting customers’ needs is our top priority. However, if you can’t make it, you can email comments to public-comment@gcrta.org, and the presentation will be posted at rideRTA.com/quarterlyopenhouse after the meeting. Have some summer fun! Now through Saturday, August 11, up to three kids aged 12 and under can ride RTA for free when accompanied by a fare-paying adult. That means more trips and more opportunities to take advantage of the fun Cleveland has to offer. Celebrate Bike to Work Day on RTA. The RTA Rack-N-Roll program offers you the opportunity for anyone to bring their bicycles on buses and trains and ride RTA for free. There are designated spaces for bicycles on HealthLine vehicles and Rapid cars, and a three-unit bike rack is mounted on the front of every bus. In addition, there are bike racks at many stations. Take the healthier way to work! RTA will operate Sunday/holiday service on Wednesday, July 4, in celebration of Independence Day. If you need help planning your trip, check the online trip planner or call the RTAnswerline at 216-621-9500. Operator-assisted trip planning, fare, and service information is available Monday – Friday, 7 a.m. – 6 p.m. and Saturday 8 a.m. – 4:30 p.m.
Get rewarded just for riding RTA. We’ve partnered with over 30 retailers and destinations to pass on discounts when you show your same-day RTA pass, Farecard, or mobile ticket.